This takes the total number of ministerial departments that have moved to GOV.UK up to 18, leaving just 6 more to go. At the same time, Public Health England and six Home Office organisations have also moved across, bringing the total number of agencies and other public bodies up to 25. This is great progress and we'd like to thank colleagues in these organisations for all their hard work over the last few months and weeks. You can read more about what the experience was like from one department's perspective in Alice Ainsworth's guest post. 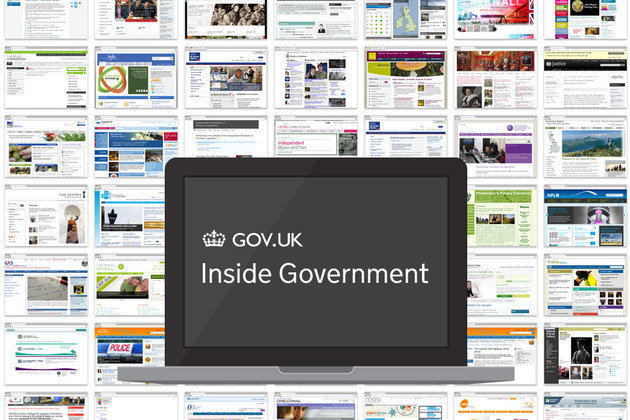 For more regular updates on Inside Government releases, you can follow our Tumblr blog, Inside Inside Government. We began transition of ministerial departments to Inside Government in November last year and by the end of April this year the remaining 6 will have completed their transition. That is very exciting for all involved. We’ll be posting more details on those launches and what 'completion' means for Inside Government in due course. The coverage of Welsh language content will improve iteratively like the rest of the site. So yes the topic page and policies will be translated, as will the 'labels' around the site. At the moment, labels are translated and imported in batches, but we heading for a more elegant approach that will allow translation on the fly. So that when we add a feature that has a frontend label the publishers in departments who do the translation can pick it up right away. This wil benefit the Wales Office pages and the overseas sites in Worldwide. Are there any plans to translate the Wales topic page and policies? On the stuff that has been translated, there are lots of little bits of English dotted on the Welsh pages e.g. 'Contents', 'biography', 'roles', 'Our governance', etc. It seems a bit of a shame that you've gone to the effort of translating some content but not all. It looks pretty messy.